Iceland’s Bárðarbunga volcano was hit by a 5.7 magnitude earthquake on Tuesday morning, the country’s Met Office has confirmed. The earthquake represents the fourth magnitude-five or greater earthquake in the past 72 hours. It comes just 24 hours after the Icelandic Met Office (IMO) lowered its warning for a possible eruption from its highest red warning to its second-highest orange level. This is after the IMO concluded the intense seismic activity had not resulted in an eruption beneath the Vatnajökull glacier. Location of the Bárðarbunga volcano in relation to the Eyjafjallajokull volcano which erupted in 2010. Image: BBC News. Scientists from the IMO, the Institute of Earth Sciences, and representatives from the Civil Protection in Iceland met to discuss the developing situation in an Advisory Board of Scientists meeting this morning. In a press release, the board confirmed that over 500 seismic events had been recorded since midnight on Monday, including a 5.7 magnitude quake which was observed beneath the Bárðarbunga caldera. Scientists believe the eruptions are a result of intense magma flow beneath the crater, resulting in a change in pressure beneath the caldera. Tuesday marks the tenth day of intense seismic activity; seismic activity surrounding the Bárðarbunga volcano has steadily increased since the summer of 2007. Scientists now understand the intense seismicity is concentrated in the most northerly 10km of the 40km long dyke. 50 million cubic metres of magma is thought to have accumulated in the dyke beneath Dyngjujökull in the past 24 hours. There are no indications that the intensity of the seismic activity near the Bárðarbunga volcano is declining, the Advisory Board commented in an earlier press release. Scientists now consider three scenarios most likely. The first scenario depicts a gradual reduction in intense seismicity associated with less magma flow in the dyke. The second suggests an eruption in the northern end of the dyke which could lead to an effusive lava eruption with limited explosions and ash-producing activity. The third scenario would be an eruption of the dyke as a fissure along a ‘significant portion, or all’ of its length. A series of floods in Jökulsá á Fjöllum with the potential for an explosive eruption could be expected. The Advisory Board cannot exclude other scenarios at present, but these are considered less likely. 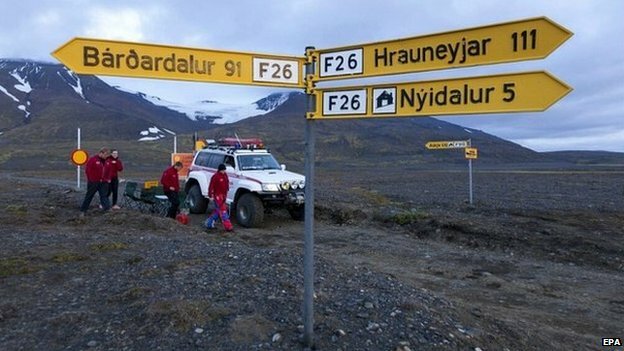 Icelandic authorities have closed many routes near Bárðarbunga and continue to monitor local ground movement. Image: BBC News. Seismicity at Bárðarbunga comes four years after the eruption of Eyjafjallajökull. The ash-plume from the eruption closed European airspace for 5 days, leading to widespread travel disruption across Europe and North America. An eruption similar to 2010 at Bárðarbunga is thought to be unlikely at present. Palni Erlendsson, a geologist at Iceland’s Met Office told the Reuters news agency that “there had been no signs of movement close to the surface”, calming fears of an imminent eruption. Magnus Tumi Gudmundsson, a professor of geophysics at the University of Iceland, told Icelandic National Broadcasting Service RUV, that “it is clear that there are no signs of abnormal melting or other signs that normally appear during a subglacial eruption”. The Advisory Board is expected to meet regularly over the coming days and weeks. The Aviation Color Code remains at the ‘Orange’ level for at least the next 24 hours. The IMO is expected to issue an update within next 48 hours.